Many cell phones, tablets, and computers today come pre-equipped to provide text-to-speech for blind users, but that hasn’t always been the case. If you owned a Speak & Spell as a kid—introduced originally by Texas Instruments in 1978—you owned one of the first electronic speech synthesizers on the commercial market. Our object this week is another early speech synthesizer, the Cybertalker 2, developed to make early networked computers accessible for blind users. 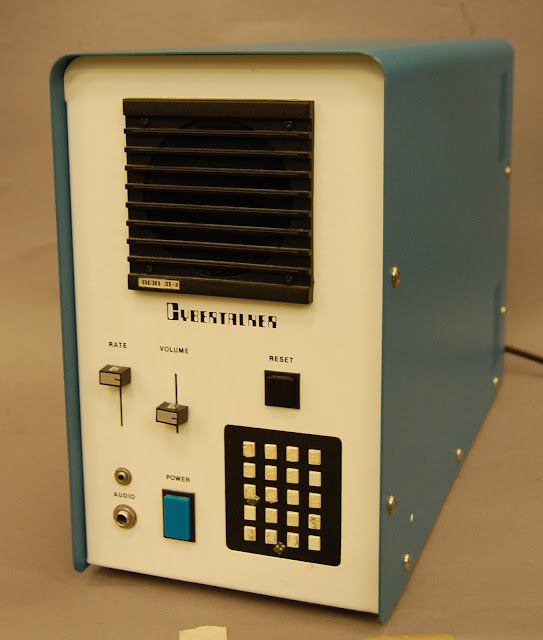 At the University of Michigan in the late 1960s, programmers developed a system that allowed multiple users to access the university’s mainframe computers from a “dumb” computer terminal. The system, known as MTS, was later adapted for university and government installations in the U.S., Great Britain, Canada, and Brazil, including NASA’s Goddard Space Center. Elliot Friedman, who was an electrical engineer and blind himself, invented the Cybertalker peripheral around 1983 and it was available for sale by the end of that year. The machine converted text into speech, both as it was input on the keyboard and as it appeared as output on the computer screen. The quality of early speech synthesizers was highly electronic and unnatural compared to modern versions which come in a variety of accents, genders, and pitches. This example in our collection, for you Mad Men lovers, was used by Terry Chaney, a researcher working for McCann Erickson, a large advertising agency in Detroit that was a major competitor of the fictional firm in the television series. Chaney nicknamed her Cybertalker “Sven” because it seemed to speak with a Nordic accent. According to Chaney, Elliott Friedman died from complications of diabetes before his speech synthesizer could be further developed.